Home » Skip*Hop Introduces BENTO ~ The Ultimate Diaper Bag! SKIP*HOP has introduced their most most innovative and functional bag to date. Designed to be a total solution for today’s busy, multi-tasking families, BENTO($100) is more than a diaper bag. This well thought out tote is perfect for both mom and dad. It includes SKIP*HOP’s insulated mealtime kit with CLIX containers, which slides into a convenient compartment—keeping food in its own special place. The perfectly sized containers store snacks and more while the insulated cooler bag and perfect-fit freezer pack keep food fresh. Of course, BENTO also features plenty of pockets for superior storage and organization, padded tote straps, an adjustable messenger strap and our patented Shuttle Clips so that it can attach to any stroller. In addition, BENTO is BPA-Free, PVC-Free and Phthalate-Free plus it features a cushioned changing pad for changes on the go. We had the chance to preview this bag back in October and LOVED it. 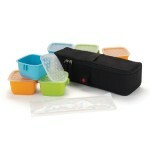 BENTO a great choice for parents who are looking for something that will take them through parenthood and beyond.